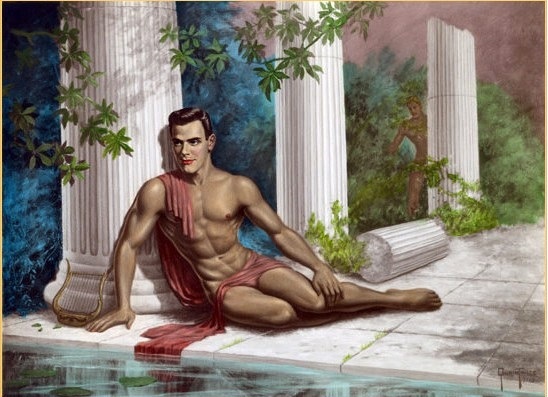 Ron Nyman (May 12, 1924 – September 16, 2000) made his way to Hollywood from England and appeared as an 'extra' in many films including the 1952 version of The Ten Commandments and starred in Gentlemen Prefer Blondes and other Marilyn Monroe films; also the Tattooed Man in "No Business Like Show Business." He was well-known as the policeman, Sgt. Charley in the Mannix series and also starred in Quincy. Badly hurt during the filming of "Battlestar Galactica" prevented his working under the lights, thus ending his career in show business. Early in his career he was one of Gordon Merrick's models and lovers.